I am having so much FUN playing with my Martha Stewart *ALL OVER THE PAGE PUNCHES* and have been creating some new fab backgrounds with these... the possibilities seem endless. The reviews for these are quite mixed, but I happen to just LOVE THEM for their versatility!! Check out some of the comments along with tips and tricks regarding these punches HERE. It takes a little practice, but the results are AWESOME!! Hope you will give them a try. Thanks for stopping by today. I love hearing from you! This is so beautiful! Your card has made me want to look into these punches...Wow! great job with the punch! wow very beautiful card america. This card is just lovely. I, too, love my, one and only, MS all over punch. I will be needing more very soon. Your card looks gorgeous in both lights. Thanks for sharing. Awesome card! Love the punched background and the fab colours! Another gorgeous card with such a fantastic BG using that punch technique! Thanks for playing along with us at Raise the Bar! Oh, my! This is absolutely delicious in every way! Stunning card! Thanks so much for playing along with us this week at Papercraft Star! 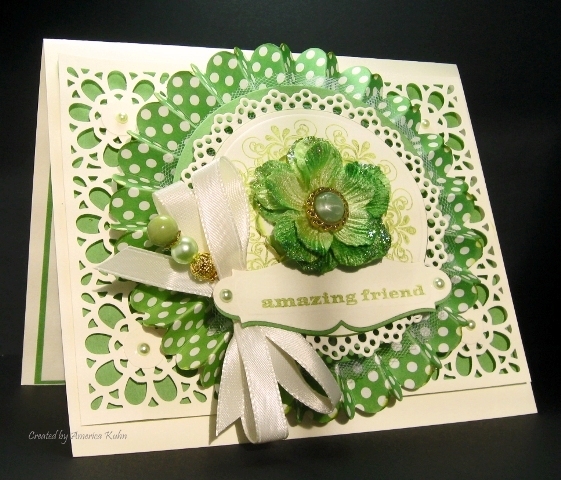 The all over punch makes a beautiful lacy background to this lovely card! Thank you for joining us this week over at the Papercraft Star. Beautiful..love the green and white. Thanks for the link, have been wanting to know more about these, looks like fun and the results are wonderful!!! Gorgeous card, love the rosette! Thank you for sharing with us at Divas & Delightful Challenges this week, good luck! Looks great, I like green. What a beautiful card. Love all the intricate details, such a lovely rosette too. Thanks for joining us at DYSU this week! Wow!! Such a gorgeous creation my friend!! LOVE the shades of green and your pretty flower!! ;) VERY SWEET!! What a beautiful card. I love the flower, rosette and many layers. Thanks for playing along with us at DYSU. Kickin card! Love the rosette & green flower! Thanks for playing The Alphabet Challenge Blog. This is amazing, I love the layers and all the beautiful detials. fabulous Card . :)) Thanks for joining DC.